Our trip to Haiti is amazing. Never before have I witnessed such poverty, devastation, resourcefulness, brokenness, faith, hope and beauty all in one week. There is so much need here one is lost to know where we can begin to help. As I sat in my mosquito tent last night, I prayed to God with so many questions, tears, gratitude, and awe. Why is it that the poorest country in the Western hemisphere had to suffer such a devastating earthquake on Jan 12th? From where do the Haitian people find their strength to go on, to pick up the rubble, and rebuild their houses, schools, hospitals, roads, churches, and lives? One of our translators today told us that he believes that although the earthquake brought so much pain, death, and suffering, many blessings have emerged; before the people were not united and now they see themselves as one people. The immediate days after the earthquake, if you had food or water you immediately shared with your neighbor and that spirit of sharing has persisted. Over and over I hear “Yes, we need solar energy in Haiti. The sun is abundant in Haiti and we have great hope we will rebuild our country.” When I saw 24 car batteries attached to a generator outside of the Notre Dame Research Center today I said to myself, this is a concrete and practical way we can make a difference. 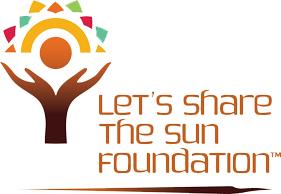 The Lets Share the Sun Foundation is committed to bringing solar energy to Haiti in 2011 and I am passionate about working together to make it happen.